See this? Yeah, we’re not talking about this. 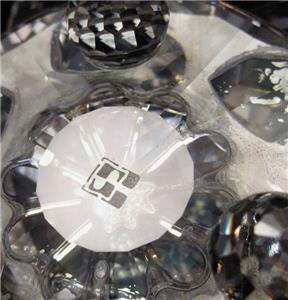 Now, I don’t know about you, but whenever I hear the words “Legendary Silver Crystal” come up in conversation – which, admittedly, almost never happens – the design that comes to mind for me is the original one in the anime: a sphere shape with hundreds (thousands?) of facets. When you consider the series as a whole, though, I think the far more iconic form of the Silver Crystal is its flower form, showcased heavily in the Sailor Moon R movie. I mean, the movie was all about flowers, so it kinda makes sense when you think about it. Before we go looking any further into this, it’s probably a good idea to stop and narrow down what kind of flower we’re talking about here, and why the Silver Crystal was given that shape. I assume not all of us are walking encyclopedias of flowers and their cultural, religious, and spiritual meanings, so it’s probably a safe place to start. [T]he lotus flower represents rebirth, both in a figurative and a literal sense. The rebirth can be a change of ideas, an acceptance of Buddha where there once was none, the dawn after one’s darkest day, a renaissance of beliefs or the ability to see past wrongs. 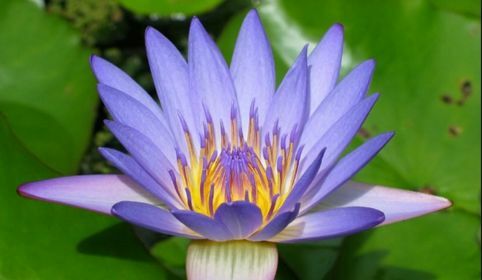 In a literal sense, the meaning of the lotus flower in Buddhism represents rebirth as a reincarnation, such as in the Buddhist religion, when a soul leaves this world in its present form to be reborn in another. 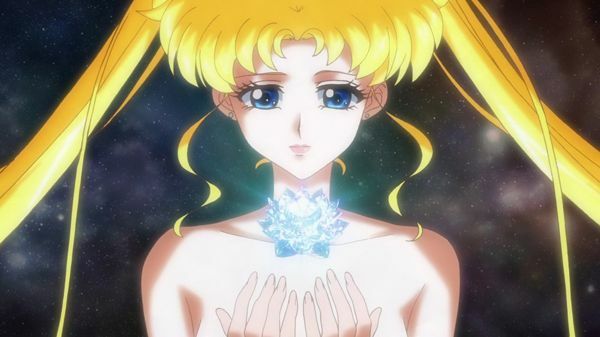 I don’t know about you, but I think that makes it a pretty good choice when it comes to the crystal symbolizing Usagi’s limitless tolerance and love. But this story wouldn’t be all that exciting if I were just tell you that “hey, it’s a lotus flower, so go home.” What’s even more interesting to me is what real-world product inspired its design. As I’ve already covered many times in the past, Ms. Takeuchi and the anime production staff often “referenced” (to put it mildly) many places, vehicles, and things from the real world. I mean, even the Crown Arcade is taken – design, name, and all! – from a real-world pachinko parlor. It turns out that the idea for a crystal lotus flower is no different! I mean, if that’s not a dead-ringer for the Silver Crystal we see on page/the screen, I don’t know what more I could do to convince you. As for the date, unfortunately I’m not too sure when this design first came on the market, but some examples I was able to find in vintage collections on eBay had the old SC marking, which was only used between 1976 and 1988,4 which firmly places this product in the market prior to Ms. Takeuchi creating her story. Speaking of SC, that leads us to a possible answer for the question posed in the title: you see, SC is not, as you’d assume, an abbreviation for Swarovski Crystal. It actually stands for… wait for it… Silver Crystal. The Swarovski Silver Crystal line debuted in 1976 with a tiny silver crystal mouse designed by our aforementioned friend, Max Schreck. With that, the line continued to grow and expand with other animals, sea creatures, and yes… flowers. The lotus flower candlestick holder is also a part of this silver crystal series. The Swarovski silver crystal line was created by a Swarovski craftsman who was able to capture a silvery shine in the facets of the lead glass crystals. Swarovski Silver Crystals are made using a combination of natural minerals and quartz sand. The crystals are then slowly cooled, which helps avoid stress and imperfections. Swarovski silver crystals have a spectral brilliance that gives them their unique silver color, giving the impression that they are made of real precious metal. Basically, a “silver crystal” is a special type of lead crystal glass that has been created in such a way as to make it look as if it were made of metal. Not much unlike our Legendary Silver Crystal, I suppose? There you have it – my take on where the Legendary Silver Crystal gets both its design and name from! While I don’t have any smoking guns, such as admissions from Ms. Takeuchi or the anime production staff, I’d say that I feel feel reasonably confident with this theory not only because of how well the design matches, but the fact that it was also a part of a collection called Silver Crystal. What’s more, not only Ms. Takeuchi’s relative owned a jewelry store, but as we’ve seen, she herself was also incredibly interested in stones and jewelry. There’s simply no way that she wouldn’t have been familiar with Swarovski and their products. But obviously I think I’m right, I wouldn’t say it otherwise! What do you think about all this? Hold water, odd coincidence? ChibiUsa came back in time and inspired Mr. Schreck? Let me know! I don’t know how you find all of this stuff! It seems clear that it was patterned after that candlestick holder. I wonder why the anime decided to give it different appearances in different seasons. It was round in the first season, lotus-shaped in the R movie but I think it was still round in the anime, teardrop in S… I can’t remember what it looked like later on. I found a picture from Crystal where it’s teardrop-shaped as well. I expect that’s much easier to draw and animate than the complex lotus crystal. There does seem to be a teardrop crystal in the center of the lotus, so maybe that’s what they were going for. 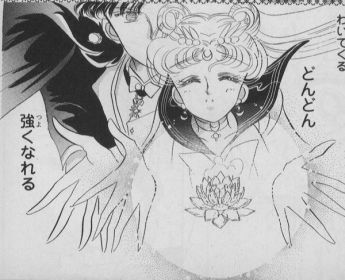 Good point about Naoko Takeuchi being familiar with jewelry… and with a rich family, she’d have been paying attention to a brand like Swarovski. And the fact the series is called “silver crystal” leaves no doubt that you found the true origin of the crystal. You should see the posts I’ve half-written where my theory ended up being wrong, and I had to scrap it in the end. 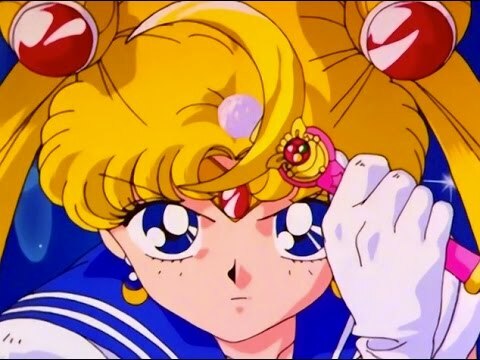 As for the shape, I wonder if it’s because the Sailor Moon R movie and anime were being done nearly concurrently, so there may not have been a lot of communication back and forth. At first, I suspected that it might have had something to do with the R movie being heavily flower-themed, but that obviously isn’t the case since the design seems to have first appeared in the final battle against Queen Beryl (edited to add: Nope! I’m just crazy.). It’s just a weird inconsistency issue, I suppose? My biggest curiosity was why it was called ‘illusionary’. Mistranslation or is it actually called illusionary silver crystal? That said, when translated that way, it feels like “illusionary” sounds like it’s modifying “silver” ([illusionary silver] crystal) and not “silver crystal” (illusionary [silver crystal]) which makes things more complex. The latter of the two would be the correct interpretation. Personally, I prefer to just refer to it as the “silver crystal” since it’s not necessary to include, and it makes it so clumsy in English to include it at every instance. However, from what I could find online, it looks like Viz and the recent translations have gone for “legendary,” so I try to conform with the terminology fans are more likely familiar with. Except Senshi and Guardians. I simply refuse to do that. So, 幻 would refer to something whose existence is not or cannot be confirmed, i.e. the stuff of legends. However, I find that “legendary” (whilst not being incorrect or inaccurate by any means) is sort of bland and I much more prefer to translate 幻の銀水晶 as “the Phantom Silver Crystal,” being in agreement with Ian Andreas Miller’s theory that it might be related to the term 幻影水晶 (gen’ei suishō) (also known as: 幽靈水晶 (yūrei suishō)). It really does nicely tie with Naoko-sensei’s interests in chemistry and gems (although translating it like that carries its own fair share of issues since the word “phantom” is already in use). I definitely agree that “legendary” isn’t strictly wrong, but it definitely could be misleading to an English audience, especially if they don’t have any background or understanding of the Japanese nuance. It could just be me, but when I hear the word “legendary” off hand, my strongest impression is more like talking about King Arthur, etc. Something great, well known, and magnificent. Though it deviates a bit from the original Japanese, if I were left in charge of the translation, I probably would go with “mystical.” I think it gets across all of the various meanings of the word quite well, while also playing into the in-universe role of the Silver Crystal. Plus, I think “Mystical Silver Crystal” has a nice ring to it. And I agree with the fact that all translators have strong opinions and different people perceive different nuances to be more important than other. Hence my partiality towards “the Phantom Silver Crystal” because of its connection to a mineralogical term. They use the flower shape in the puzzle match app game as well! Nice write up Jason! I don’t recall the flower ever showing up in the fight against Queen Beryl though…? I remember the first time I saw it it was in the Sailor Moon R Movie against Fiore. In the manga yes it changed, anime no, not against beryl, but in the Hearts on Ice movie it took it’d original shape from the manga’s beginnings. I prefer the old English dub name Imperium Silver Crystal over its current one. I’m also still used to Scout, although Warrior/Soldier is fine too, Guardian sounds odd for our Sailor ladies. It fits the cats more than anything. I actually prefer the teardrop version. But the lotus one is really beautiful, and leave it to sneaky Naoko to base it off something in real life, again! I tried looking for popular crystals in a sphere/teardrop shape, but unfortunately I didn’t come up with a whole lot. Probably that design is just something she made up. Not too hard, I suppose, considering it’s a pretty generic shape! I’m sure convenience was a big reason the crystal became spherical in the 90s anime. A sphere is easy to draw and it’s easy to incorporate into merchandise items. Aside from personal preference, I like the sphere best because one can attach lunar magic lore to it; the moon is considered most powerful when it’s full. Roundness makes the crystal into a tiny, eternally full moon. Fitting for the most powerful magical item in the Sailor Moon universe. You know, I never actually thought about how much more fitting the sphere is when you consider the shape of the moon. Makes it even more appropriate as a “full moon” inside the crescent moon-shaped Moon Stick! Wow, I’m really impressed that you managed to dig out details like that. Btw. I have never thought that the drop form and the flower form were contradictions. I always thought of the upside down drop chrystal as a flower bud that just opened up when fully activated. How many silver Crystal are there?? There is Sailor moons one, from the past, and the one from the future which chibiusa stole. Then chibiusa goes back to the past. Does she go with with this same Crystal, or does she goes with her own (which will be the pink sugar crystal)? If it’s not the case, it means that the Queen doesn’t have it anymore, and how could it work in the past? ?